At a Freshers Fair, all of the societies within a university set up stalls or stands on campus and recruit students to join their societies. Freshers Fairs tend to be used as welcome events for new students that provide ways for students to network, find groups with common interests, and settle into university life. The fairs are also an opportunity for the societies to promote their upcoming events and intro sessions, and give out useful items and information to students. Freshers fairs are also where many future scientists are introduced to the biology and chemistry societies that will form the core of their scientific networks in their many years of study to come. Some Freshers Fairs can include fairground rides and other fun activities and even invite members of the public to attend. We thought we’d take some time to introduce you to the idea of the Freshers Fair and some of the great biological societies that Addgene has had the opportunity to work with at Freshers Fairs in the past year. Since 1996, Cambridge Biosoc’s goal has been to promote interest in the biological sciences amongst the student community at the the University of Cambridge and within the general public. The society organises talks by prominent scientists, including Nobel Laureates, who speak about their work and current, trending topics in their area of research. The society also organises PhD information events and summer internship information sessions to help undergraduate students with their applications. The society currently has 1,283 members, who comprise undergraduates, graduate students, postdocs, faculty members, and the general public. The Chemical Society was founded in 1944 with the goal of facilitating networking between chemistry students, especially those studying to earn a PhD. The society encourages interactions between undergraduates and PhD students so that they can help support each other and provide advice. The society organises numerous recreational and educational events throughout the year, including a Christmas Chemistry symposium and a career night. The society also visits high schools to promote chemistry degrees and provide advice to students who want to study chemistry. The society currently has 352 members, ranging from undergrad all the way up to professors. The Biological Society based at the University of Oxford currently has around 700 members and hosts a range of scientific meetings for students to attend. It also hosts high level academic debates for its members to become involved with. The society provides talks and career support for a range of different scientific disciplines, as well as social and networking events. 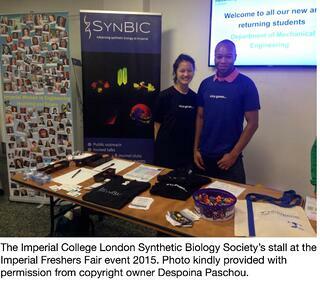 The Synthetic Biology Society is a new society at Imperial College London for students in this emerging field. It has gained over 170 members in its first year. The society facilitates opportunities to learn about Synthetic Biology and exciting new technologies in the field. One of the main aims of the society is to bridge the knowledge gap between biology and synthetic biology by providing education and networking opportunities for society members as well as arranging collaborations and conferences for their students. Another large goal of the organisation is to encourage iGEM alumni to mentor younger students in society and to support iGEM alumni-industry networking to promote the creation of start ups and biotech spin offs. The Synthetic Biology Society also aims to develop a range of talks for both students and the general public, career events, and networking meetups. The society hopes to help young scientists interested in this field excel and develop their career skills for positions both inside and outside academia. At Addgene, we’re incredibly glad to see these biological societies engaging with young scholars. We believe it’s very important to develop a network of fellow scientists that you can grow with, learn from, and mentor while pursuing your research interests. Scientific societies like those mentioned above provide strong foundations upon which young scientists can build powerful networks and we encourage them them to keep up the good work! What scientific or biological societies were you a part of in undergrad or grad school? How did these societies help (or continue to help) you grow as a scientist and what benefits did they provide during your education? Let us know in the comments section below! Do you know of a society or event which would benefit from some Addgene support? Please get in touch, as we aim to support a couple of events a year for the scientific community. While we are not able to help with every request, we do aim to support events and scientific community activities throughout Europe and the world. So get in touch!